June 2011 – Oh Remy! Is this déjà-vu or are you just repeating yourself? Ryhmä-X 3/1983 vas a very exciting issue. In my opinion the issue had a much better flow to it than the two previous ones. Of course, number 1/1983 had Arcade in it, so naturally it didn’t please me. 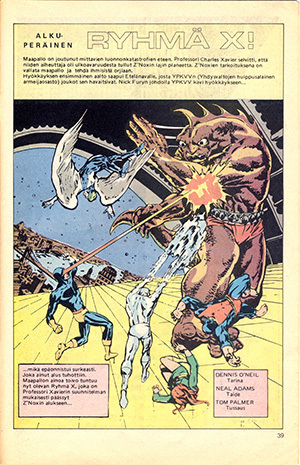 And 2/1984 was still just warming up for this issue, but what an issue! In last issue Proteus, Moira MacTaggert‘s hidden son, had escaped and was sucking life out of people on Muir Island. 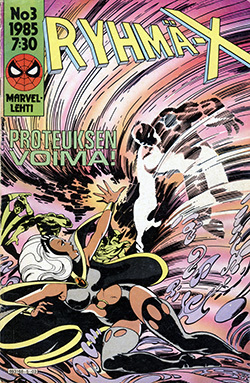 This issue (original: X-Men 127-128) continued where the last one ended – Proteus is closing on Storm, who is injured and having a hard time keeping him away from sucking the life out of her. Just when he’s about to succeed, Moira shoots at him but misses. Scott intervenes, giving Proteus a chance to escape once again. 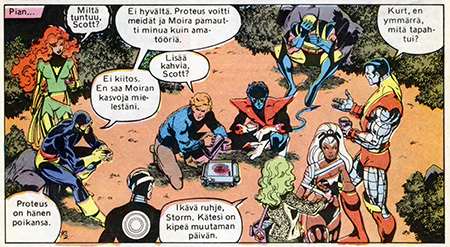 The X-Men are left licking their wounds while Moira goes after Proteus – she has an idea where he is heading. Meanwhile, Scott displays his impeccable leadership skills by picking a fight with badly shaken Wolverine (I’m shocked, Wolverine shaking and stammering?!) to get him going. It works, but still I must question his logic – and so did the rest of the X-Men, I’m sure. Scott shows his leadership skills. Wolverine is in shock after being attacked by Proteus. What does Scott do? Well, he throws his coffee on Wolverine and picks a fight. Nice job, Scott. Banshee in the middle: "More coffee, Scott?" Aww, how cute! Their med kit comes with some hot java! And even if there is a murderer on the loose, there's always time for a cup of coffee, right Scott? Meanwhile, Proteus has found his father and takes over his body and feelings, as we find out when Moira finds out what has happened. Proteus, having his father’s feelings, is suffering from a severe case of Oedipus complex, to the horror of his mother and the reader. At this point the X-Men arrive on the scene and a battle ensues where reality is warped by Proteus. Finally, after having used up his father’s body, which is now in a frail condition, he gets slammed against a wall, breaking the body around him, revealing him as an energy form. 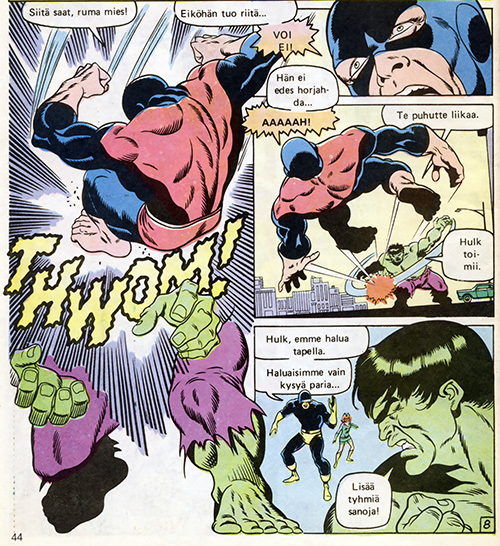 Colossus in his metallic form – remember metals are poisonous to Proteus – hits Proteus, killing him. They all return to Muir Island headquarters where Banshee, having lost his voice, decides to stay with Moira for now. 1) "You must be confused. Let me help you. Whenever I possess a person I also get their thoughts." 2) "I feel everything my father did. I have never experienced such power and passion." 3) "He and me are alike. We take what we want." 4) "And I want... you!" Proteus having a severe case of Oedipus complex, to the horror of Moira and the reader. 1) Beast: "Got you, ugly man!" 2) (last panel) Scott: "Hulk, we don't want to fight. We just want to ask you something." 3) Hulk: "More stupid words!" Indeed! Maybe you shouldn't have kicked his face in if you just wanted to talk to him, Scott. Well, in the end they get to calm him down, turning him back to Bruce Banner. Oh but wait, having anger management issues, Bruce turns back into Hulk as soon as the army arrives. Doh! Wait, didn’t we see this already? 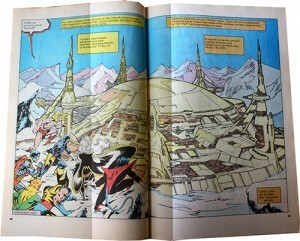 As I mentioned in “About this blog” the Finnish Marvel comics are not identical to the originals. At times the original issues have been scrambled and often our magazines miss a few pages from here and there. For example, the first issue of Ryhmä-X (1/1984) reprinted X-Men 113 (Sep 1978) with an adventure called: “X-Men: Showdown!” The Finnish publication was missing seven pages from the original according to Sarjakuvarock. Usually our magazines are missing only the first page from each story – or so I have inferred from the fact that most of the stories only miss one page, and usually the first page of the comic is an “opening image” to the comic, and we don’t have those in the middle of our magazines, which collect multiple issues of the originals. Ryhmä-X 1/1984: The "sun god's" town. One thing that also causes trouble is how the originals have full page advertisements in the middle of the magazines. The Finnish magazines have advertisements only at the beginning and at the end of the magazine but never, to my knowlegde, in the middle of a story. 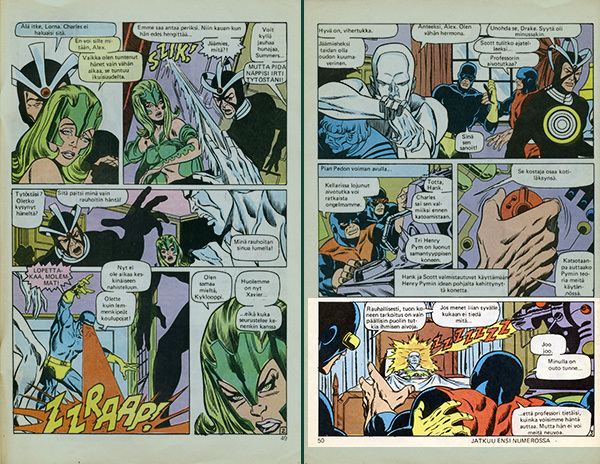 As you know, all magazines have even and odd pages following each other, but in the original Marvel magazines, because of the advertisements, you get two odd or even pages following each other. This is not a problem unless this is followed by a spread ment to be kept together like a full spread image of a building, like the view of the “sun god’s” town in Ryhmä-X 1/1984. Basically this means that if nothing is done the image might have to be divided into two pages on different spreads. So far in these early issues this is not that common a problem, but I remember this was quite common in the 90’s when the artists were looking for more dynamic layouts and broke the conventional panel divisions. That’s why the reader mail was usually divided between the comic on separate individual pages to allow the comic’s spreads kept together. Unfortunately sometimes they ran out of space and had to divide spreads causing very confusing pages and dialogue, unless you realised the text was in fact referring a part of either the previous or the following page. Wait, didn’t we see this already? …Already? 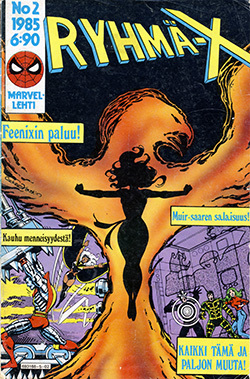 As I said, in this issue, Ryhmä-X 3/1985, the editing of the original issues was more obvious than usually. 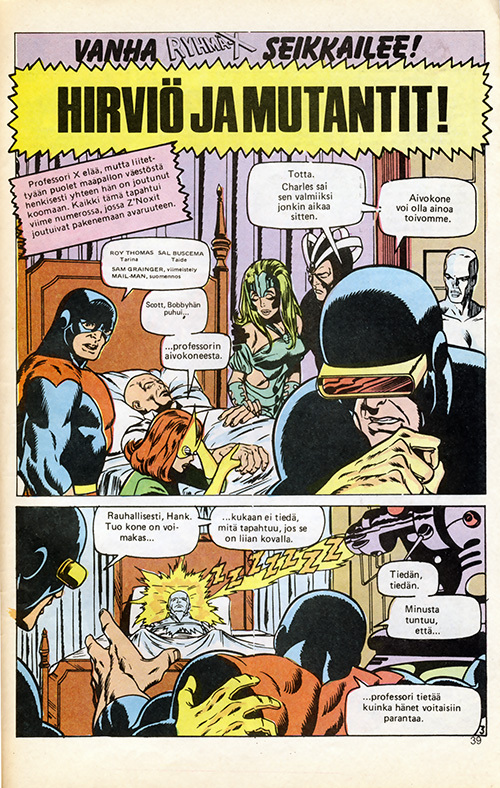 The second story begins with the X-Men standing around Professor X’s bed, wondering what to do. One weird detail is that Beast “talks” the credits of the story. Then Jean Grey – still Marvel girl at this point – reminds that Bobby, the Iceman, mentioned some brain machine. Scott is like, yeah, that’s right and in the next panel Beast and Scott are shooting the machine at Professor Xavier. Well, that was fast! Ryhmä-X 3/1985: Beginning of the second story. Notice Beast talking the credits. Also, the first panel is rewritten: 1) Jean: "Scott, Bobby did mention Professor's brain machine." 2) Scott: "True. Charles finished it some time ago. The brain machine could be our only hope." In the panel below Scott and Beast have the same conversation as in the previous issue with only minor unmeaningful changes. I did have a nagging feeling I had seen this once before, but didn’t pay attention to it. Then I began trying to find the colourist information for these stories and then I noticed it. 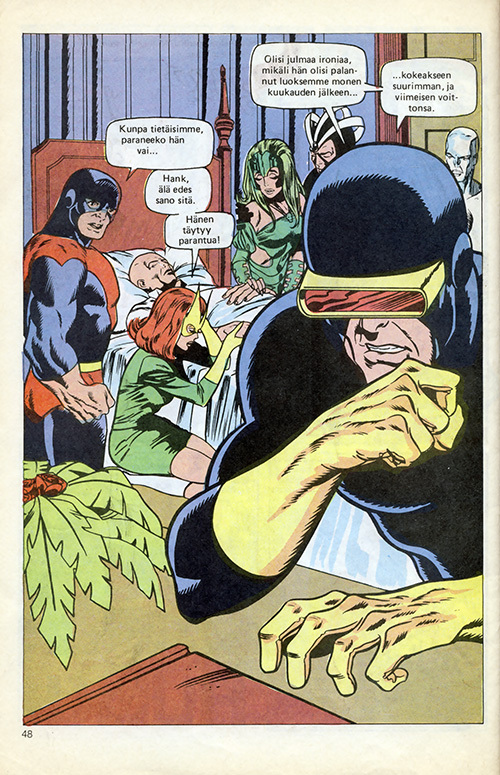 The previous issue had an identical image of the X-Men standing around Xavier’s bed. It was just cut in half. And the panel on the bottom was the last panel from the previous number. They had just shown those two panels again and explained what was going on and cut off the part where Iceman and Havok are fighting over Lorna Dane aka Polaris. In Ryhmä-X 2/1985 we see the original image of the X-Men around Xavier's bed. 1) Hank: "If only we knew if he will heal or not..." 2) Jean: "Hank, don't even think about it. He must get well!" 3) Scott: "It would be cruel irony if he had returned to us after many months..." "...just to experience the greatest and last of his victories." The ending of Ryhmä-X 2/1985. Notice the last panel. I don’t have access – yet! – to the original issues aside from a few exceptions, but it would be very interesting to compare the originals to these Finnish issues to find out the differences in page distribution and in translations. 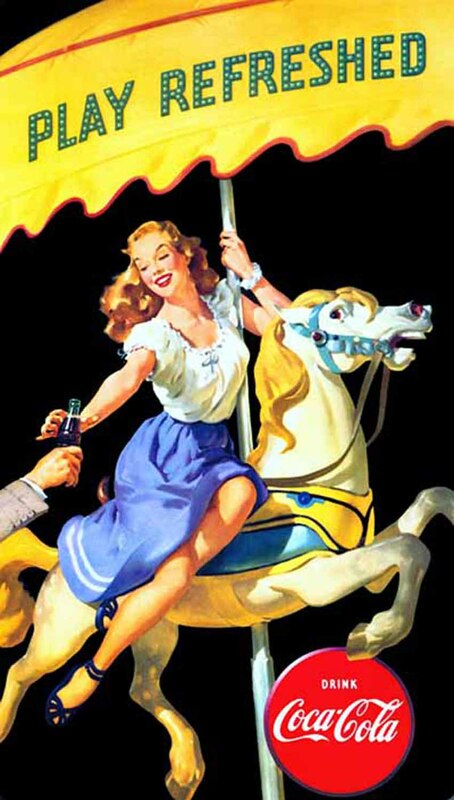 Author MMPosted on June 30, 2011 June 30, 2011 Categories Review, Ryhmä-XLeave a comment on Is this déjà-vu or are you just repeating yourself? In my youth Marvel comics were one thing that separated me from my class mates, but today they have brought me together with people I never would have met otherwise. The latest example of this was when I was reading Ryhmä-X 2/1985. But first, let’s take a look at the magazine itself. The first story of the magazine takes place in the Muir Island. Moira MacTaggert has been hiding her son, “Mutantti X” – or Proteus as he calls himself – and now he has escaped and is sucking the life out of people on the island. This happens just when the majority of the X-Men get back to Professor X‘s mansion and run into Beast and find out that Jean Grey is at Muir Island. They call the island only to hear the women scream when Proteus attacks them. On Muir Island the X-Men are once again united and join Moira in the search for her son. Interestingly Jean breathes out the first name of Jason Wyngarde to Scott, half conscious after Proteus’s attack, and continues to have flashbacks to 18th century. Moira, on the other hand, says she should have killed her son ages ago. In the end Wolverine finds Proteus, who tries to take over his body. Proteus doesn’t know that Wolverine’s bones are covered with metal, which is poison to Proteus, and he has to draw back to his former body. Proteus alters reality around them, and the story ends in a cliffhanger where Storm is having a hard time keeping Proteus away. The second story of the magazine continues the adventure of a previous assemblage of the X-Men. They have invaded a Z’Nox‘s ship and manage to banish the Z’Nox planet with the joined energy of all the good people of Earth, channeled through professor Xavier and the X-Men, and finally through the eyes of Cyclops, shooting a ray of “good vibes” or something to the planet which makes the Z’Nox escape from Earth’s vicinity. After the effort Xavier collapses to the ground leaving the X-Men fighting over women over his bedside. What does a 34 year old Egyptologist and a 10 year old Kazakhstan boy have in common? This happened last Wednesday. I had been shopping with my husband and at half past nine in the evening we finally sat in our home bus. My husband sat opposite of me. At Hakaniemi a group of foreigners came on board. That’s quite common since there are many ethnic stores in the area, so I didn’t pay any attention to them. A man from the group sat next to my husband and a woman next to me. I was reading Ryhmä-X 2/1985 when suddenly the woman got up and before I really knew what had happened, a young boy, maybe 10 years old, jumped excitedly to the seat next to me and leaned very openly over me to be able to read my magazine better! :D I think everybody in the vicinity laughed out loud in the bus. I turned the magazine so he could see the comic better. The huge monster caused an excited "Wow!" I asked him if he could understand Finnish, but he replied to me in English. The boy was so excited about my magazine he could hardly contain himself even though he could not understand the Finnish text in it. He pointed at the cover image and named all the characters and their super powers. Then we went through the whole magazine and he named every superhero to me. Luckily the issue had pictures of very many heroes. He also told me he liked Storm and Nightcrawler. I agreed with him that Storm was very cool. I was surprised to learn he didn’t like Wolverine, but when I told him he was my favourite, he immediately started to compliment his strength (the boy said Wolverine was even stronger than Colossus) and the cool blades that come from the back of his hands. He also asked me if I’d seen all the X-Men movies. He was especially very excited about the new X-Men movie right now in the theaters – X-Men: First class – and complimented it, saying it was very good. He was disappointed that I hadn’t seen the Wolverine movie, but on the other hand we both liked Daredevil as a character and had seen that movie. He also checked if I knew Elektra – of course I do! It was so cute! The boy’s name was Daniel and he was half Russian and half Kazakhstan. He had a limited English vocabulary so he didn’t understand half of what I told him and vice versa. But the mutual understanding we had about X-Men and other Marvel superheroes… It was instant friendship. We spoke about the Marvel heroes the whole 20 minutes bus ride back home and I was very sorry when I had to get off at my stop. I wish I’d had some extra magazines with me I could have given to him. I think he said he’d seen all the movies but had never read any of the comics. I even thought about giving him the magazine I was reading, but they are so hard to come by and year 1985 is so expensive I just couldn’t let go of the issue. If I run into him or his father, who could speak Finnish very well, and the boy said he was also Finnish, meaning that he lived in Finland, I’ll try to give them some of my extra comics. 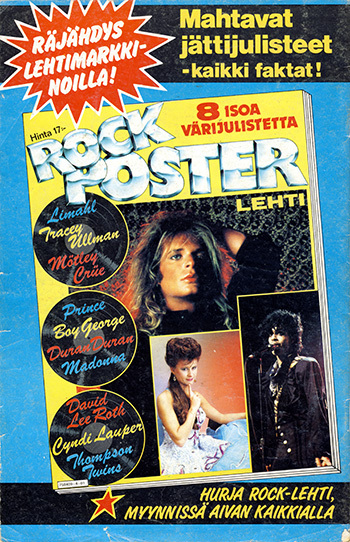 Ryhmä-X 2/1985 back cover advertising RockPoster magazine. This one caused a few giggles between us - '80s style. Daniel, wherever you are, I wish you all the best and hope your life will be filled with superhero comics! But the meeting left me thinking it’s an amazing world when a 10 year old boy and a 34 year old Egyptologist find a common ground and understanding immediately from a common hobby. And even though Daniel had not seen any Marvel comics previously, he knew the characters through movies. And it must be because of the movies he saw some of the characters differently from me. Whereas Jean Grey is a “good” character, to him she was “bad” and “evil”. Daniel kept on pointing the cover image of the Phoenix and telling me she was not to be trusted and how the bird phoenix was evil, very bad. I tried to tell him Jean was good, but when I remembered he knew her through movies, she might indeed seem a very evil and dangerous creature. Also, who has not wished they had some awesome superpowers. The superheroes are cool and I would definitely welcome an ability to fly fast like Aurora from the Alpha Flight, have healing abilities like Wolverine from the X-Men, and be lucky like “Hannu Hanhi” (Gladstone Gander). I know, he’s not a superhero, but with his luck he might as well be. Ryhmä-X 2/1985: 1) Jean: "I'm not sure about that, but I can do this." 2) "Jean turns around and slides towards Lorna, changing the structure of her clothes telekinetically; with each blink of an eye a new outfit appears." 3) "It's a desperate attempt to lift the spirits and change the subject." 4) "This time it works." - Women and clothes. So easy to distract. (I'm so going to return to this topic later in the future.) The person sitting in chair is not Jean but Lorna, who's supposed to have green hair. Colourist's mistake. It’s funny in a way that in my youth I felt the Marvel comics separated me from my class mates and now they are one of those cool things which have brought me together with new friends. Once I made it public I had a thing with Marvel comics, I suddenly found out I was surrounded by other Marvel enthusiasts. Even the girls came out of the closet, telling they had read a few comics or at least seen the movies and knew the characters. But the funny thing is, there were these two men in my student organization whom I felt I didn’t have much in common with and honestly I doubt we would have become good friends as things were. Don’t get me wrong, I liked them both, but we just didn’t have a natural reason to hang around together outside of school. But when we learned about each other’s Marvel collections it was immediate friendship. I think it might have changed the way we perceived each other and since then we have become better friends and have this mutual understanding between us. Maybe even through this blog I will make new friends or at least meet other interesting people while reading Marvel comics in public. P.S. Yesterday I saw a woman in my home bus with a cool Marvel bag. I almost commented it to her, but then kept my silence like any good Finn. When I took out my Marvel comic, she noticed it and I could see she shook her head a bit and smiled. See, we are everywhere.